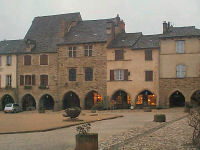 Figeac lies on the river Cele, 10km from Le Bouyssou. It is a beautiful town with an unspoilt medieval centre. Like many other provincial towns hereabouts, it owes its beginnings to the foundation of an abbey. In the Middle Ages it became a centre of tanning, which partly accounts for many houses whose top floors have solelhos or open-sided wooden galleries used for drying skins. There is a delightful range of houses of the medieval and classical periods, both stone and half timbered with brick noggings, adorned with carvings. Jean-Francois Champollion, who was the first to decipher Egyptian hieroglyphics, was born in Figeac. The building now houses a museum dedicated to his life and work. Villefranche de Rouergue, 20km from Le Bouyssou, must be as close as you can get to what a French provincial town used to be like. It lies on the bend of the river Aveyron, built as a bastide by Alphonse de Poitiers in 1252, the town became rich on copper from the surrounding mines and its privilege of minting coins. From the fifteenth to the eighteeth centuries, its wealthy men built the magnificent houses that grace the cobbled streets to this day. 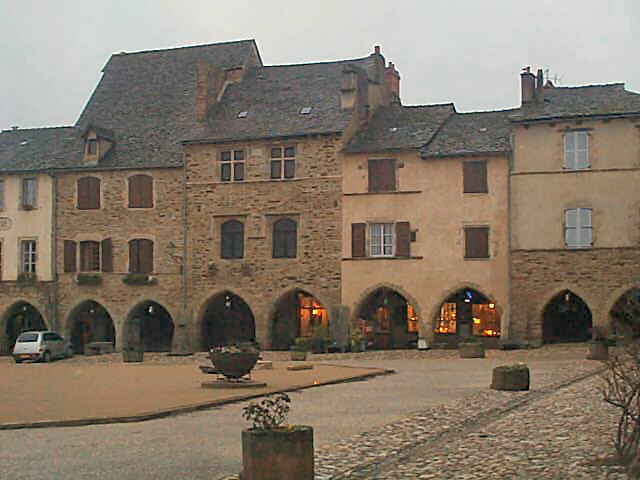 Place Notre-Dame, the lovliest bastide central square in the region, is built on a slope, so the uphill houses are much higher than the downhill and you enter at the corners underneath the buildings. All the houses are arcaded at ground floor level. The east side square is dominated by the church of Notre-Dame with its colossal porch and bell tower, nearly 60m high. The interior has some fine late fifteenth-century stained glass and carved choir stalls . The Thursday market is said to be one of the largest in France. Foissac is a village 5 km from Le Bouyssou, with a Prehistoric cave and park from the chalcolithic era. It has spectacular minerals and works of art sculpted by nature over thousands of years. It is a feast for the eyes, a veritable underground museum. There are mortal remains left by our ancestors 4000 years ago as the cave served as a shelter for men and their animals. It was also a burial place with skeletons intact on the banks of the subterranean river. The park recreates a settlement from this time, with buildings and living displays. Belcastel is the closest of the ‘most beautiful villages’, with its”calades” or paved lanes, distinctive houses, ovens, fountain and its church. Belcastel did not struggle to earn this title. The castle dates back to the XIth century and is flanked by one square and five round towers, a moat, drawbridge and dungeons. 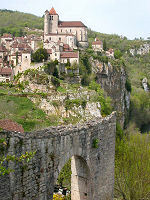 A narrow, five-arched “donkey’s” back bridge spans the Aveyron river. Facing the old bridge is an acclaimed restaurant serving some of the best food in the reagion. Peyrusse le Roc is approx 10km to the East from Le Bouyssou. 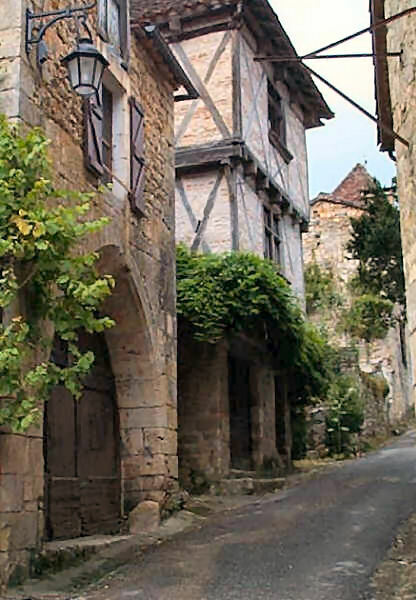 By beautiful lanes across the causse you find one of the most remarkable old villages in this corner of France. The modern village sits astride the head of a narrow wooded valley, a tiny huddle of long-eaved, half- timbered houses abutting the ancient walls. In the valley below, hidden in the steep woods, lie the remains of a medieval stronghold, abandoned around 1700, that once stood guard over the silver-rich country round and about. Sauveterre de Rouergue A cobbled mule path leads to the gate towers and stones of a Gothic church, synagogue and hospital stand roofless beneath an unscalable pinnacle of rock crowned by twin towers (vertical ladders have been attached to the rock face to gain access for the brave). A path crosses the stream to the ancient packhorse bridge and ruined mill. There is a steep climb back to the village but do not miss the medieval garden. Sauveterre de Rouergue, 44km, another ‘most beautiful village’, is a royal, 13-century bastide, built around the largest arcaded square in Rouergue (60 by 40 meters) and bordered by woodframe houses. 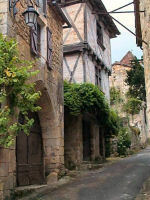 It is one of the most intact fortified towns in southwest France. It was in 1281 that 60 families settled in this royal bastide, safe from suffering at the hands of brigands and the caprices of the lords of the vicinity. Sauveterre has been fortified since it was founded, is still encircled by ramparts and pierced by four gates looking upon the mains treets, all of which converge at the centre square. They have a cider and chestnut fair in October. Villeneuve d’ Aveyron is on the road to Villefranche de Rouergue from Le Bouyssou, approximately 13km. The bastide grafted itself on to a former refuge surrounding a monastery and was in succession a refuge, a ducal bastide then a royal bastide at the end of the 13th century. The fortified towers were built to defend the town. Here you will also find arcades, 13th century houses, merchants houses built in the 15th-16th centuries and the town gateway. The church of Saint-Sepulcre 11th-14th century, part romanesque part Gothic has rare murals depicting scenes of the pilgrim way to Santiago de Compostela. In July a medieval fete with parade, market and feast is not to missed. 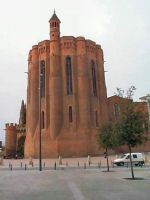 Toulouse-Lautrec Museum70Km, is a tale of two cities, modern cosmopolitian one half and the second a medieval marvel, this being the Cathedral of St-Cecile’s, the lagest brick building in the world. The Basilica of St-Cecile dominates the Albi skyline with an awe-inspiring presence. 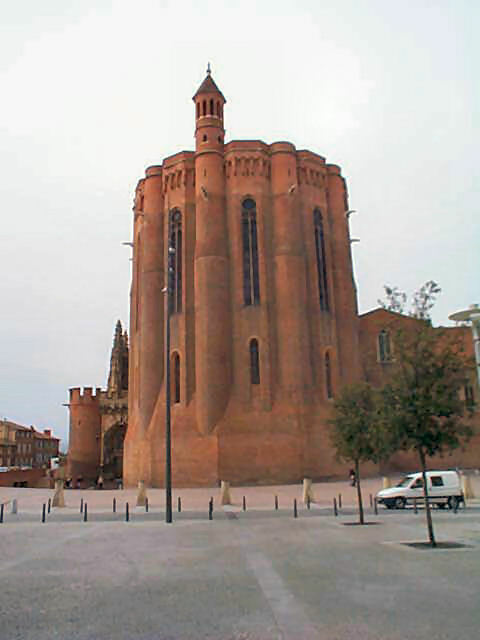 Built by Christian loyalists as a defence against the Cathare Heresy starting in the 13th century, the cathedral is a masterpiece of meridional gothic architecture. 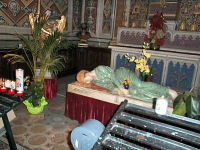 The cathedral took two centuries to build, from 1282 to 1480. The contrast between the sober simplicity of the exterior and the sumptuous decoration and detail inside is remarkable. St Cirq LapopieFrescoes which cover the vaulted ceilings (97 meters long, 28 meters wide, the work being by Italian Renaissance artists) form the largest work to be found anywhere in France. They have such clear colours they could have been painted yesterday. The classical French Organ, built by Christophe Moucherel in 1736 is considered one of the finest in France. 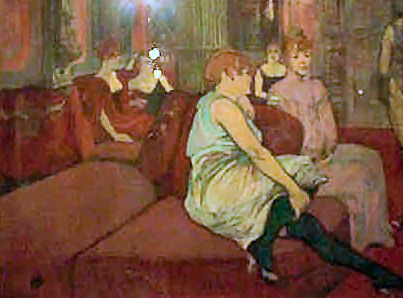 Albi is the home of the Toulouse-Lautrec Museum. More than 1000 works, including the 31 famous posters, are kept within the walls of the Bishop’s Palace, next to the cathedral. This is the largest public collection of his works anywhere in the world and not to be missed. 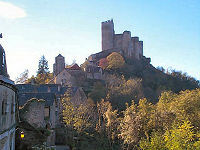 Najac, 35Km, is an unusual ‘most beautiful village’. It has just one main street running along the top of a ridge and is towered over by the Najac fortress at the highest point on the ridge. The castle was built in the 13th century around an earlier tower, as a defence for Villefranche-de-Rouergue . The strategic importance came to the fore during the hundred years war, during which it became a key strategic cathar stronghold. The cathars were of course defeated and in Najac they were forced to build a church as punishment, now this church is considered to be one of the finest gothic churches in the region. There are lots of fairs during the summertime; wine, cheese and very good vide greniers (car boot sales). 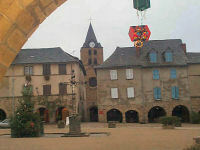 St Cirq Lapopie, a most beautiful village, about 40 kilometers from Le Bouyssou is an irresistable journey. Two minutes from Le Bouyssou one joins the road that follows the Lot river all the way to this cliff-edge village, perched high above the south bank of the river. It has cobbled lanes, half timbered houses and gardens. Cordes sur Ciel (55Km from Le Bouyssou) is a bastide town founded in 1222. With its hilltop setting (not for the faint hearted, but well worth the climb) the town consists of some lovely medieval houses along the steep paved streets that lead up the hill and is one of the best preserved medieval towns. 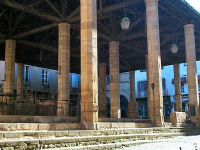 The market hall at the top with its stone pillar supports is a site worth the visit. 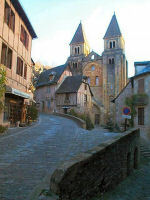 Conques (30km). 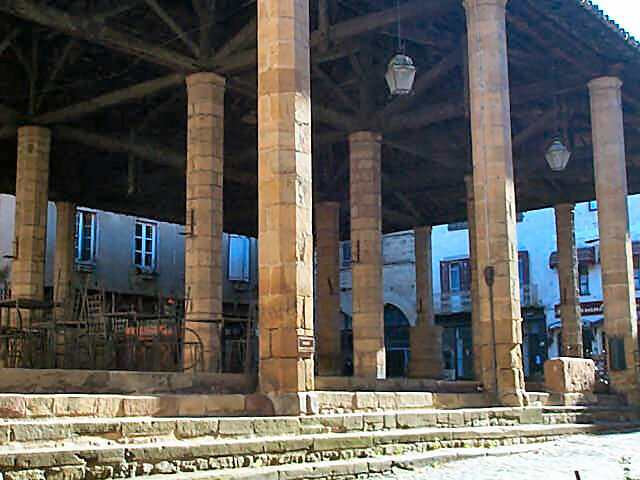 Thanks to the relics of Sainte-Foy, brought from Agen in 1866, Conques became a major staging post after Le Puy en Velay on the pilgrim way to Santiago de Compostela. Today many modern day pilgrims still follow in the footsteps of those who went before on this historic journey. Created by the hands of monks during the 10th-12th centuries, the site of Conques is a masterpiece of romanesque art. Viaduc de MillauThe abbey and cloisters rank among the most beautiful expressions of ornamental sculpture of the Middle Ages. 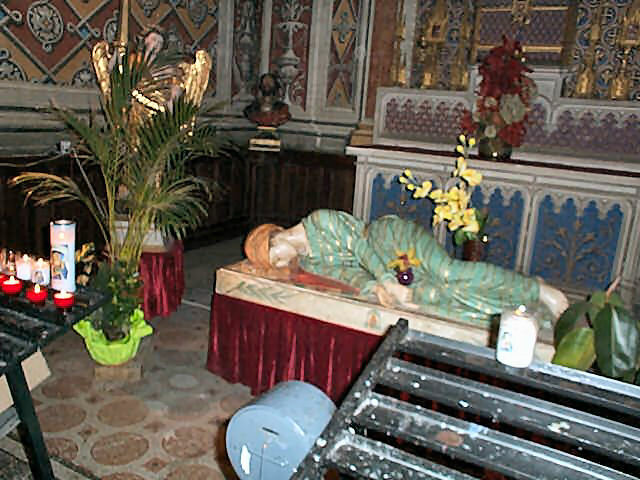 The village has guarded its fabulous collection of gold treasures for 12 centuries, amongst which the jewel in the crown is the reliquary stature of Sainte-Foy, quite simply a masterpiece. The village itself, with its narrow streets and its old medieval houses with their sloping rooves covered in”lauzes” has remained little changed and retains its millennial purity. 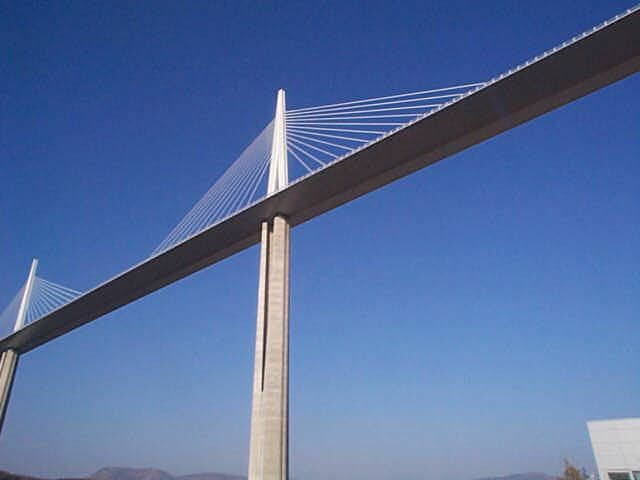 Viaduc de Millau (the tallest vehicular bridge in the world) was built in 38 months between 2001-2004. The Viaduct crosses the Tarn river on the A75. It cost €300,000,000 to build and was designed by Michel Virlogeux, the architect being Lord Norman Foster. 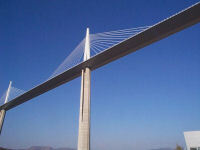 The design is cable-stayed and one mast’s summit is at 343 meters (1,125ft). There is a visitors centre at the base of this must see site.